Sweet-natured and extremely funny, Huntz Hall made a career of playing a youthful dope in the Bowery Boys, East Side Kids, and Dead End Kids beginning in 1935 and lasting through the 1950s. Hall was born August 15, 1920 in New York City as Henry Richard Hall. There were 13 siblings before him! Hall was an Irish Catholic whose dad was an air-conditioning repairman who obviously loved children. There were two more born after Huntz. Hall’s formal education was in Catholic grammar school, which was followed by a stint at New York’s Professional Children’s School, where he learned about drama. In addition, he could sing and performed as a boy soprano in the Madison Square Quintette professional group. Hall was discovered by actor/director Martin Gabel, Best Supporting Actor Tony Award winner for the Broadway play Big Fish, Little Fish and also known for TV’s What’s My Line?. 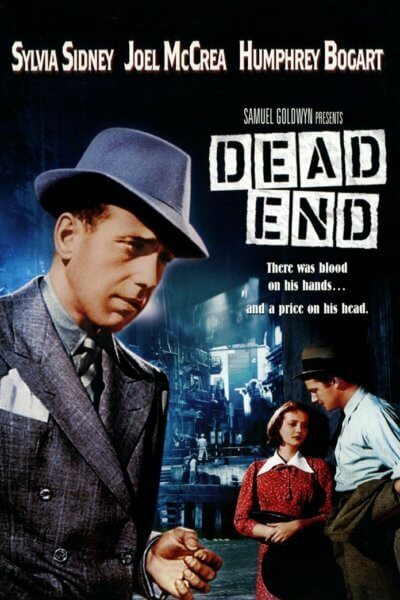 Gabel had Hall audition for one of the tough street kids in Sidney Kingsley’s play Dead End in 1935. Hall was 15. One of the other kids was Leo Gorcey, then 18. The play was a tremendous success on the New York stage. Subsequently, Hollywood producer Samuel Goldwyn bought the play for a film production to be directed by William Wyler in 1937. Since there were no kid actors in Hollywood who could match the natural “New York” look and attitude of the actors in the play, Goldwyn signed all six of the play’s kids to contracts. They included Billy Halop, Gabe Dell, Bobby Jordan, Bernard Punsly, Huntz Hall, and Leo Gorcey. In Hollywood, the film was being produced by The Samuel Goldwyn Company and distributed by United Artists. The film version starred Joel McCrea, Sylvia Sydney, and Humphrey Bogart, with Claire Trevor, Marjorie Main, and Wendy Barrie in significant supporting roles. Of course, the “boys” were making their film debut as the Dead End Kids. Come Academy Awards time, the movie was nominated as Best Picture and for Best Art Direction (Richard Day). The Oscar nominations also went to cinematographer Gregg Toland and Claire Trevor for Best Supporting Actress. All the accolades for the picture gave the Dead End Kids a spectacular send-off in Hollywood. Warner Bros tried to capitalize on the gang’s popularity by shoving them into some other pictures of similar genre such as Angels With Dirty Faces, Hell’s Kitchen, Little Tough Guy, and Angels Wash Their Faces, all in the late 1930s. In 1940 Hall was 20 years old. He got romantically involved with a dancer named Elsie May Anderson and they got married. Their marriage lasted until 1944. While all this was happening, World War II was raging. Being patriotic, Hall enlisted in the Army to do his duty. There is some discrepancy about how he managed to be in the Army and still crank out a series of films during the war years. Starting in 1946, Hall got together again with Leo Gorcey to make a series of Bowery Boys comedies for Monogram Pictures. It was the lowest of the low studios and cranked out potboilers by the dozen. It was quite a successful studio for what they did, but they were definitely on the “Z” list of studios. Their first film was Live Wires (1946) which starred Leo Gorcey as “Slip,” a good for nothing who can’t keep a job. But, he gets hired by the District Attorney’s office to serve summons and warrants to criminals. The film was in black and white, was 65 minutes long, and co-starred Huntz Hall, Bobby Jordan, and Mike Mazurki as a tough guy. As a comedy, it was a good second feature. The year 1946 was a busy one for the boys because they churned out five films that year, including In Fast Company, Bowery Bombshell, Spook Busters and Mr. Hex. In all the films, the boys got involved in some cockamamie scheme that led to trouble, laughs, and escapes! 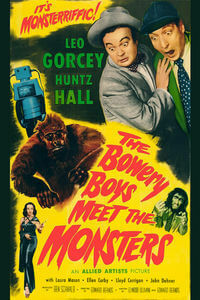 The Bowery Boys films were very popular with audiences, usually young kids, and the series ran from 1946 until 1958. There were approximately 47 films in the series, and some of the titles were Bowery Buckaroos (1947), Trouble Makers (1948), Hold That Baby! (1949), Blonde Dynamite (1950), Ghost Chasers (1951), Here Come the Marines (1952), Loose in London (1953), Paris Playboys (1954), Bowery to Bagdad (1955), Hot Shots (1956), Hold That Hypnotist (1957), and their final film, In the Money (1958). Hall, himself, was “in the money” because he owned a 10% stake in all the Bowery Boys movies. While all the Bowery Boys movies were being made, Hall had time to marry beautiful showgirl Leslie Wright. They produced a son named Leslie Richard (Gary), born September 22, 1949. Gary snubbed show business and became a Reverend. He also had a son, Hall’s only grandson. Hall took some time off and went into semi-retirement. But an actor doesn’t stay retired for long. Hall jumped right back into the Hollywood whirl, this time in television. He was cast in many, many television series. He acted in a couple of the Flipper TV shows in 1966, Gentle Giant in 1967, five episodes of The Chicago Teddy Bears in 1971, a movie Herbie Rides Again in 1974, and two featured episodes of Walt Disney’s Wonderful World of Color in 1975. He jumped back into feature films by appearing in Won Ton Ton: The Dog Who Saved Hollywood in 1976, and played Jesse Lasky, one of the founders of Paramount Pictures, in director Ken Russell’s 1977 biographical film Valentino, about silent film star Rudolph Valentino. Casting directors still remembered Huntz Hall and he was still favored as a guest actor in many more series, including Matt Helm, CHIPS (1978), Different Strokes (1982), The Ratings Game (1984), Night Heat (1988), and Daddy Dearest (1993). Hall also took to the boards and did some dinner theater until 1994, when he retired. The man who gave us so many laughs by playing goofy characters suffered from a severe heart condition and died January 30, 1999 in North Hollywood, California. But, his performances live on in all those whacky Bowery Boys movies.